The Bothell community will get an initial look at North Creek High, Northshore School District’s sparkling new high school on Monday, Nov. 21. The ribbon cutting and open house, scheduled to begin at 6:30 p.m., will allow onlookers to tour the school and learn about some of the facility’s fascinating features. Built to house 1,600 students as Northshore transitions to a four-year high school model, North Creek High alleviates overcrowding district-wide. 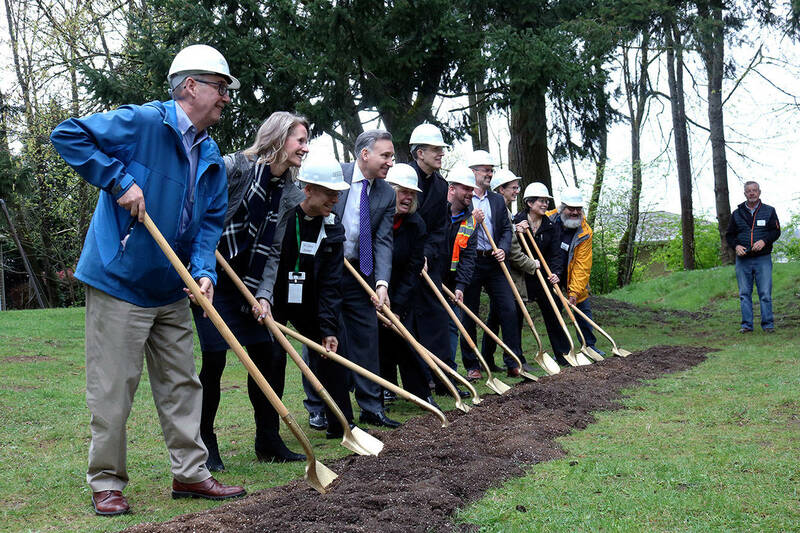 North Creek will help to balance student numbers at the three existing high schools, and is the first new comprehensive high school in the district since Woodinville High was opened in 1983. Joseph Robertson, the school’s assistant principal, said he’s seen community members peering in the windows of the school, eager for a peek inside. But the school is about much more than simply shuffling students and balancing class sizes. North Creek is already a leader in green design and integrated technology, and comes as a major breath of fresh air to educational philosophy. Among the more striking features of the building’s design is a classroom essentially open to the hallway. The classrooms don’t really have doors, but rather a wall that folds away and allows the learning space to spill outward. Small glass rooms dot the hallway, an area staff refers to as “collaboration cubes.” They look a little like glass elevators, but the cubes allow a group of students to work together in an isolated environment on special projects. Students can even write on the glass walls — a feature common in many of the classrooms. The school itself is visually striking. The building was designed to let in as much natural light as possible, with massive windows and little need for lights during the day. The gym is large and bright, with a 14-foot LED screen on each of the four walls. The screens will be used as multipurpose scoreboards and during assembly presentations. The glass-walled library dominates the east end of Building One, which houses the administrative offices, a clinic and classrooms. The library doesn’t have security gates and many books will be kept in the hallway, using an honor system to get books back from students. Among the unique art department features is a multipurpose theater, where the seats can be expanded or collapsed for different seating configurations. Technically, the theater is state-of-the-art. The cafeteria, though, is at the heart of the awe-inspiring design features. ‘Home of the JAGUARS,’ the school’s mascot, is visible in massive letters through the glass walls of the commons. Lights hang at odd heights from the ceiling, and large wooden pillars — reclaimed when on-site trees were cut down during construction — still drip sap near the northern edge of the room. A 19-foot LED screen hangs on the Western wall. McDowell and Robertson say they plan to use the screen during community meetings, business conferences and for student announcements, and that the LED system didn’t cost any more than a pull-down screen and projector. Each classroom has an LED screen instead of a blackboard or smartboard, and utilizes LED lighting to cut down on energy costs. The school also harnesses several green energy sources, with solar panels on the roof and a geothermal heating and cooling system. The campus also includes a multipurpose athletic field with a track, baseball and softball fields, tennis courts and a JV soccer field. Athletes will be among the first to use the North Creek campus, as future Jaguars can begin lifting in January and the North Creek weight room is expected to open before spring arrives. Practices for 2017 fall sports — including the inaugural North Creek football season — begins June 1. North Creek will have freshmen, sophomores and juniors during its first academic year, pulling mainly from Skyview Junior High. The athletic teams will all compete at the varsity level, and are expected to join the Class 4A KingCo division along with the other Northshore School District programs.